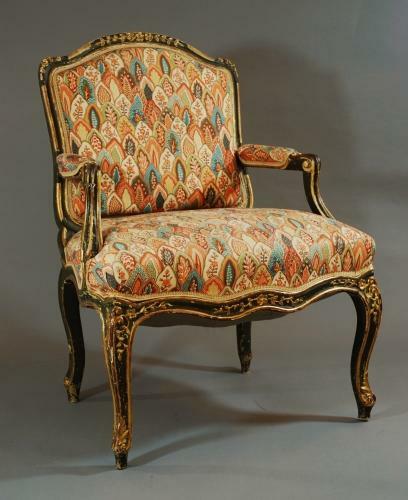 A decorative late 19thc/early 20thc painted French fauteuil (open armchair). The chair frame has been finished in a deep green paint with areas of gilding, especially on the carved sections. The chair has a shaped top rail with a central flower & leaf crested carving. This leads down to a 'lattice' design carving (in a light cream paint) with a flower & leaf carving on the corners. There is further lattice decoration on the sides of the frame. The shaped arms have upholstered arm rests & s-scroll arm supports. The seat rail is serpentine shaped, again with flower & leaf carving, leading to cabriole legs with similar decoration. At the base of the legs is an acanthus carved decoration leading down to a scroll foot. This chair has a 'shabby chic' feel and has some chipping to the paintwork, but I feel this adds to the character of the piece. The upholstery is quite unusual but can always be re-upholstered by the purchaser if required. The paintwork is a deep green colour with areas of gilding, particularly on the carved decoration. This chair is of stable construction & can go straight into a property.